Sorry for anyone reading these posts that has no interest in this cake but I needed to break it down into a couple of days for my sanity. This is the last one. Now that all the hard work has been done comes the fun part, finishing off the Butterfly and Blossom cake. You should have your cake ready, cooked and cooled in the shape of a dome. 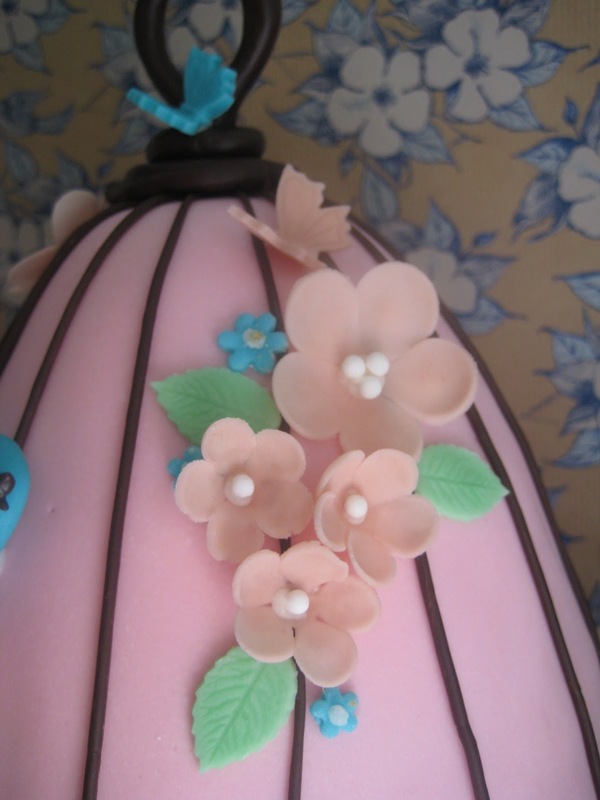 The cake mold I used is called a Dolly Varden cake mold here in Australia. It's the type of cake you stick a doll into to make a 'princess' type cake and I think Wilton also make one but call it something else. It's measurements are approx 14.5 cm (7 1/4 inch) tall and 19 cm (9 1/2 inch) diameter. Now it's time to put it all together, you'll need some cake experience to follow this and a bit of equipment. Make buttercream to fill and coat cake, I used Italian Meringue buttercream. Make a small batch of royal icing. I just mix up a little premade which you can get from cake deco stores or even spotlight in a bag which looks like icing sugar. 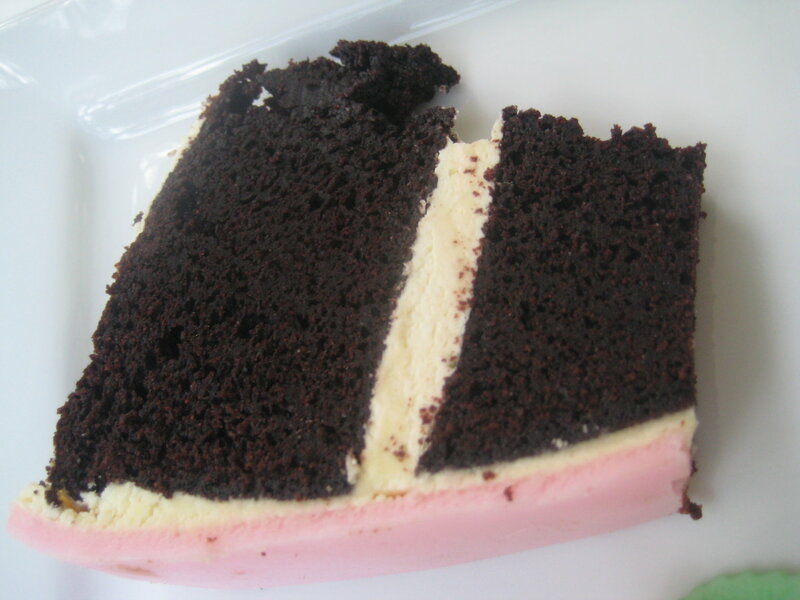 Slice cake evenly into 3 sections, fill and then cover with a thin layer of buttercream. 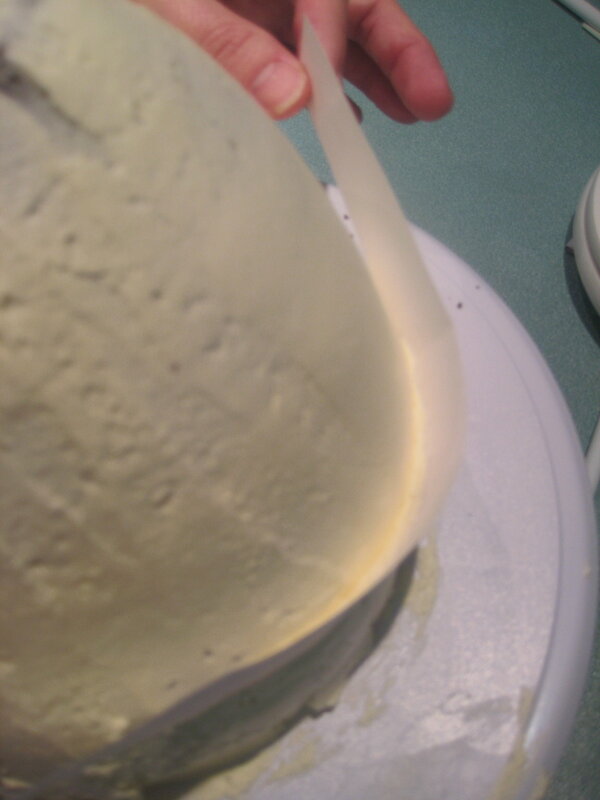 Ensure that buttercream is very smooth as this will be the base for your fondant to sit on. To make a smooth finish you can cut a long strip of paper 5cms or 1 1/2 inch wide and holding each end scrape up towards the top, wiping away excess. Can you even see the paper in this pic? Look at the top and you will see my helpers hand holding a strip of paper which is used to gently pull up and towards you to wipe off excess and hopefully get a smooth finish. Roll out fondant with rolling pin to at approx 50cm diameter, carefully lift fondant over cake and gently shape into cake making sure not to tear. Remove excess from bottom with sharp knife. Using a couple of fondant smoothers in each hand, ensure the cake has a smooth finish. Measure around the cake to determine how many stripes you will require for the cage. I made 15 spaced approx every 4 cms, mark intervals into the fondant with a toothpick at the base of the cake. Using a klay gun press or similar tool press out very thin strips of chocolate modeling paste or brown fondant. This tool pushes the fondant/paste through and makes long evenly sized strips, it's kind of like a playdoh pet grooming set but a little more sophisticated. If you don't have this tool you might be able to use a pasta machine to make a thin sheet and cut very fine even strips. Pop strips onto cake using the marks at the base of the cake as a guideline. I pop a toothpick into the top of the cake to wrap the top of the stips around and hold them in place. When all strips are in place you can secure them with a little edible glue if required (I didn't bother) and then remove the toothpick. 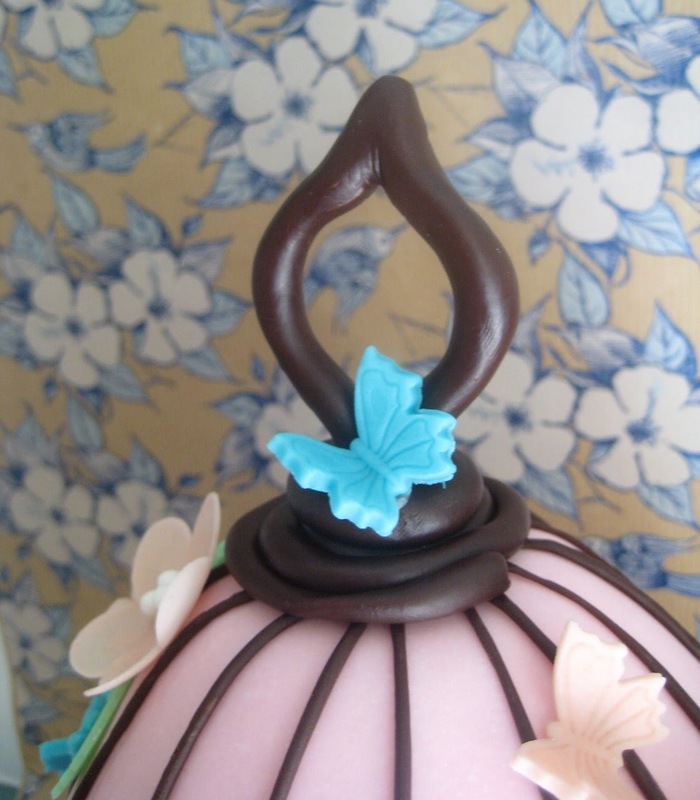 Put the handle base (the round chocolate modeling disk) onto the top of the cake right through the toothpick with a little royal icing and then pop the handle in the centre, securing both in place with the toothpick. If you don't like using non edible toothpicks you could try using spagetti. Roll a little extra chocolate modeling paste to wrap around in between the 2 pieces to make the handle look finished. 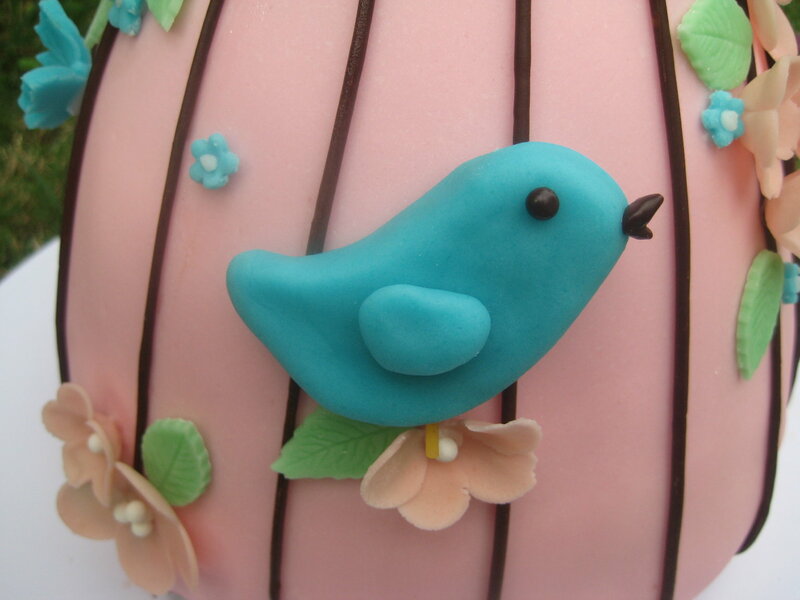 Secure the bird onto the cake with a little royal icing. Cut a small piece of spagetti to use as a 'branch' or stand and pop into cake under the bird. This will help hold the bird which is kind of heavy onto the cake. You can colour the spagetti with brown food colour if you like. Secure the blossoms, leaves and butterflies onto the cake with royal icing. You might like to arrange on the bench prior to securing them to the cake to make sure you are pleased with your proposed design. Finish cake with a ribbon on the base. I do cupcakes and novelty cakes as a hobby for friends and family but want to try and get a bit more adventerous, i have made a cake the same shape as yours in 3 layers and covered in a buttercream. I have refridgerated teh cake once i had covered in the buttercream to make the surface easier to lay the sugar paste on. I have laid teh sugarpaste over and it streatched really thin and I ended up with loads of folds on one side at the bottom. Is this common? Iwas wondering if my sugarpaste wasn't big enough in diameter. The cake was about 9 " tall and 6 " wide. Can you offer any advice? Hi, if the sugarpaste reached all the way to the bottom I guess it was big enough. 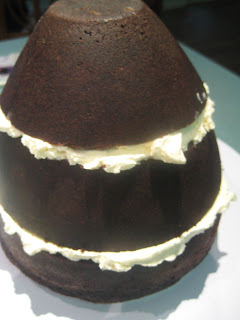 You need to kind of pat it down and smooth from the top while you readjust the bottom bits of the cake around. I think the best way would be to check out one of the many videos on you tube on how to cover a cake in fondant (or sugarpaste). That is ALMOST too pretty to eat!